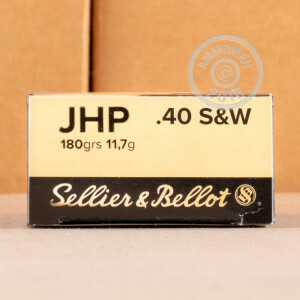 Effective self-defense ammunition for your everyday carry oughtn’t be prohibitively expensive -- and it is not if you invest in this affordable but nonetheless high quality cartridge by Czech manufacturer Sellier & Bellot. This round’s 180 grain projectile is jacketed with CuZn 10, a strong yet economical alloy which guarantees your shot will feed well in a semi-automatic and penetrate most common types of light barriers. The notches around this bullet’s tip serve to control and balance out the expansion provided by the hollow point, so you can count on the kind of terminal performance you would need to neutralize a threat fast. You’ll likely want to squeeze off a few shots with this ammo before entrusting your safety to it. 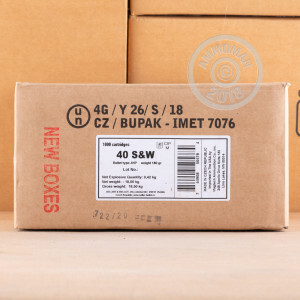 With 50 of them at your disposal, you’ll have an adequate number of rounds to carry out a test run before you fill your pistol’s magazine. 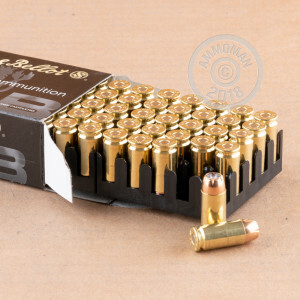 Even the ones you do fire will keep some value, as their brass casings are tough enough to endure multiple reloads.